Hawaii offers a cautionary tale of a socialist future for the U.S.
HNN: …Waiki's first felony conviction was in 2005 when he was just 21 years old — for forgery. Judge Glenn Hara sentenced him to 90 days in jail and home detention after refusing to give him a second chance. The judge told him he "has a gross disregard for authority. He does not give a rip, he is going to do what he wants to do." Waiki served five years of probation. In 2013. he was caught with meth and a loaded gun. He pleaded guilty and was sentenced to 18 months in jail and four years probation. Then, in November 2017, he broke probation and moved to Las Vegas. After police brought him back, prosecutors wanted his bail increased. But Judge Henry Nakamoto refused. Waiki has been a fugitive since missing a court hearing in March…. The next highest fundraising candidate, Esther Kiaaina, has been fundraising since February 2018. She technically “raised” more money, but only by giving herself $28,500 in loans. As of June 30 her campaign was $11,572 in debt…. maybe her establishment friends will bail her out. And what friends she has! 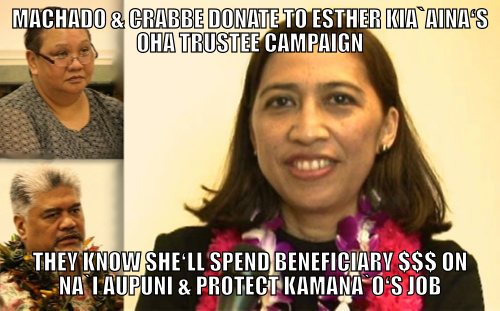 Embattled OHA CEO Kamanaopono Crabbe and OHA Trustee Chairwoman Colette Machado both donated to Esther on Feb. 27…. Colette and Crabbe know who to back in order to protect their jobs. Clearly, if you want to see change at OHA, Esther Kiaaina is not the candidate to vote for. KGI: …Kanuikapono Public Charter School and Learning Center is going before the Hawaii State Public Charter School Commission today to keep their doors open for the upcoming school year. “It was a composition and compliance issue,” said Kathryn Winters Smith, interim school director and charter school program director. “We’ve done that (brought Kanuikapono governing board into compliance) and the other matters that the commission had brought up have also been resolved…. Conflicts of interest on the school board, noncompliance with composition laws, school policies that are out of line with the PCS contract and potentially illegal use of credit cards are the commission’s concerns. The minutes of the April 18 meeting indicate the Kanuikapono PCS governing board was dissolved and the INC board — which included three members of the PCS governing board — was established to serve as an interim governing board for the public charter school. Other concerns were that governing board minutes aren’t complete, the school’s admissions policy displayed on their website hasn’t been approved by the commission, and potential issues with enrollment preferences and disenrollment policies…. Lines of credit was the last concern of the commission, which stems from a June 8 corrective action plan that was submitted by the school indicating previously undisclosed lines of credit. KHON: …The Honolulu Authority for Rapid Transportation recently awarded a construction contract to Road & Highway Builders LLC to fix Kamehameha Highway. The project, called Phase 1, was awarded in the amount of $25,989,989.00. HART spokesman Bill Brennan says the repaving project will start from Acacia Road near the Pearl Highlands Center to the Hawaiian Electric power plant in Waiau. In addition to re surfacing, crews will perform road-widening work, fix traffic signals, as well as perform curb and gutter work. HNN: …Last Thursday, the executive director of the city's Housing Office, Marc Alexander, said this at a news conference: "Our general statistics indicate that about 40 percent of our people who are in shelters every month now exit into permanent housing." Hawaii News Now checked in with the island's three largest homeless service providers to get more information on the new number. And it turns out that city announcement was wrong, considerably overstating how many people were finding housing. The Institute for Human Services is by far Oahu's largest homeless service provider. In May, it had 637 clients in its emergency and transitional shelters. Out of those, 27 moved into permanent housing — or 4 percent. That same month, US Vets placed 36 people from shelter into permanent housing, or 11 percent. "I want to clarify what I stated. Or what I meant to state is that every month when people exit from the shelters, of those who exit over 40 percent exit into permanent housing," said Alexander…. The others ended up in a variety of places, including detox, another housing program or back on the streets…. In May, the same month the city referenced, more than 60 others went to detox, transitional housing, respite homes or to their families back on the mainland…. MW: The two leading Democratic Party candidates for governor seem to agree that either a higher minimum wage, or at least something that increases local wages, is a must for people struggling to survive Hawaii’s cost of living…. I say the discussion should not be about a minimum wage or a "living'' wage or that new darling of the progressive left, the Universal Basic Income. It should be about in novation and creating much be tier jobs than our stagnant ones: government employment, hotel workers and retail sales clerks. Those jobs do not create great product growth, and therefore, there is no great profit growth. In fact, raising the minimum wage will likely mean more businesses will move to more part-time employees in order to avoid the mandatory benefits for full-time workers. All of which means the low-level employee getting $15.79 or $16 an hour will still be required to have two - maybe three - jobs to support a family. We - and I include the public employee unions here with their 75,000 members maintain workers in minimal advancement jobs that are out of tune with these technical times…. Methane Hysteria next on Hawaii Environmental Agenda? IM: Methane Emissions pose a serious threat to the Earth. Methane is a very potent greenhouse gas (GHG)…. KHON: …The body cameras will be deployed to HPD stations in phases, going district by district, starting next month. Lieutenants and officers will be wearing them while on duty. It will cost $1.5 million a year to support the body camera program…. HPD says the cameras will be rolled out in phases starting with District 1, Downtown, in mid-August, followed by Districts 6 and 7. It will end with the traffic division and District 4, the east side of the island in 2021…. HNN: …Maui High School's principal is struggling to find enough classroom space. The campus in Kahului is expecting about 2,023 students, including 600 freshmen…..
To free up space, the school has already gotten rid of its daycare center for students with children. They've also taken other measures. "We have well over 30 portables. As the school continued to grow, they kept putting portables on the campus with the idea that when Kihei High School gets built, that some of theses portables will be taken away," said Yap. But the timeline for the construction of Kihei High School keeps getting pushed back from the initial target of 2014. The state now expects the first phase for 800 students to be finished by August 2021, but some South Maui families are still skeptical…. Meanwhile, Kihei Charter School will boost its enrollment to nearly 700 with the opening of its consolidated campus in late August. Students in grades K through 12 had been spread out at three different sites…. Flashback 2017: Where is the high school Ing says we have achieved? HTH: …Time and time again, health care workers pointed to accessible residential treatment facilities as a huge need. Even with places such as Hawaii Island Recovery, Eliza Wille, program director and therapist there, said the resources in the community aren’t enough to meet the need. The “gold standard” for treatment, she said, is residential care, but that type of care is lacking in the state, particularly for people on assistance programs such as QUEST. A list maintained by the state Department of Health of treatment agencies funded by its Alcohol and Drug Abuse Division showed there are no Hawaii Island agencies identified as offering residential services, with the closest one being Aloha House on Maui…. CB: Can An Algae Supplement Turn Around A Struggling Hawaii Startup? Cardax, after burning through nearly $58 million, is finally making money and trying to expand sales on the mainland…..
Cardax Inc. and its chief executive, David Watumull, have plunged almost $58 million into a quest to commercialize a synthetic version of a compound found in algae.…Less than a year after inking a deal to sell Cardax’s supplement ZanthoSyn at GNC’s 3,000 company-owned stores, the product is flying off the shelves in Hawaii. Cardax reported revenue of just over $313,000 for the first quarter of 2018, based completely on sales of ZanthoSyn. With a retail price of about $40 a bottle, that’s thousands of (7,825) bottles for the first three months of 2018. And it’s a big growth over the same quarter in 2017, when Cardax reported revenue of $107,000…. Watumull has long been at the center of Hawaii’s efforts to develop high-growth companies, particularly in the life sciences. Jay Fidell, a long-time tech industry watcher and president of the public affairs organization ThinkTech Hawaii, calls Watumull an “iconic” figure in Hawaii’s attempts to develop a technology industry on the early 2000s. Big Q: How is your child (or children) spending the summer?